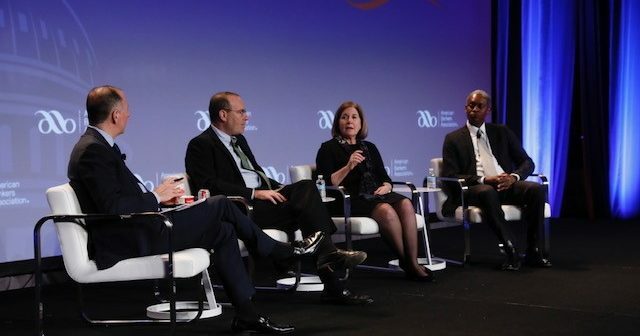 From left, ABA President and CEO Rob Nichols, Richmond Fed President and CEO Tom Barkin, Kansas City Fed President and CEO Esther George and Atlanta Fed President and CEO Raphael Bostic speak at ABA's Washington Summit, April 3, 2019. Photo by David Hathcox. Barkin, Bostic and George also discussed their views on post-crisis regulatory reforms, capital levels, catastrophe planning, cannabis banking, the move toward real-time payments and the effects of bank consolidation. A video of their remarks is available.